Tackling complex problems is a tough task for a city under the best of circumstances. But without having evidence-based data to help set priorities and develop strategies, it becomes nearly impossible. That’s why VHDA is teaming up with five partner organizations in Lynchburg to conduct a study of the city’s interrelated problems of poverty, homelessness and housing. The five organizations – Lynchburg Redevelopment and Housing Authority, Rush Lifetime Homes, Miriam's House, Greater Lynchburg Habitat for Humanity, and Lynchburg Community Action Group – are known collectively as the Lynchburg Regional Housing Coalition. Its study is being funded by a one of VHDA’s Community Impact Grants. Community Impact Grants are funded through VHDA’s Reach Virginia program. Each year, VHDA contributes a substantial portion of our net revenues to this program, which helps support our partners and nonprofits as they work to meet local housing needs. The Lynchburg study will incorporate a new data platform that’s designed to aggregate and analyze data more effectively. Among other topics, it will look at the Housing Choice Voucher program, which helps low-income households with rent payments; the quality and distribution of rental units and single-family structures; the occupancy rates of rental units; and the circumstances of rent-burdened populations, including veterans, the homeless and people with disabilities. The study is expected to be complete next year. Its ultimate objective is to inform local leaders and make a compelling case for including affordable housing as part of the regional planning process. 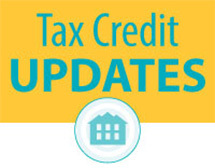 VHDA's Housing Credit department just released the blacklined Virginia Qualified Allocation Plan (QAP) showing proposed changes for implementation on Jan. 1, 2019. View the blacklined QAP. Please consider joining us for the QAP Forum Discussion on Sept. 18. The forum is free, and registration for the Virginia Housing Alliance Housing Credit Conference is not required. ‎Sept. 18,‎ ‎2018 at ‎10‎:‎00‎ ‎a.m. - 11‎:‎30‎ ‎a.m. E.S.T. Register for these events on our website. 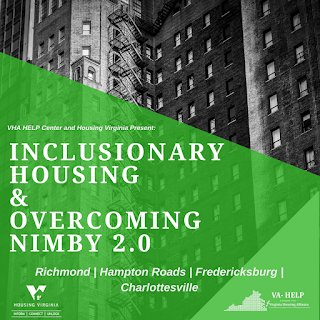 Join Housing Virginia for new Inclusionary Housing and Overcoming NIMBY 2.0 workshops. Housing Virginia is excited to partner with Virginia Housing Alliance's HELP Center to to offer either half-day or full-day workshops focused on strategies to develop inclusive, mixed-income communities, as well as techniques for addressing resistance to affordable housing. Following the release of the first Virginia-specific "Inclusionary Housing Guidebook" in 2017, Housing Virginia is offering a series of workshops that will demonstrate how localities can use old and new tools at their disposal to create vibrant, mixed-income communities. These sessions will explore why affordable homes are a critical component to healthy neighborhoods, what the state and federal legal framework allows regarding "inclusionary zoning" and other land use tools, how other localities in Virginia and across the nation are accomplishing this goal, and why communities must build custom-tailored solutions for their specific housing needs. These trainings are targeted to local officials, planners, advocates, and housing practitioners. In 2016, Housing Virginia conducted its first round of "Overcoming NIMBY" trainings aimed at equipping housing advocates and providers with the tools necessary to counter common opposition to more affordable homes in their communities. 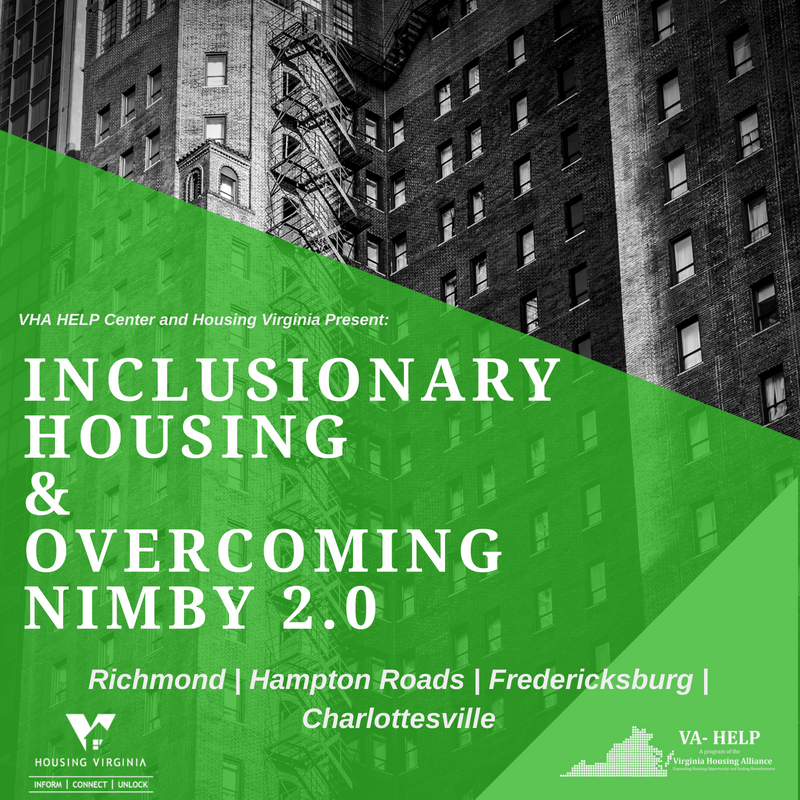 This year, Housing Virginia is launching its next round of "Overcoming NIMBY" trainings with all new material and recommendations. Attendees will learn what NIMBY-ism (Not In My Backyard) is, why our current messaging often does more harm than good, and how new groundbreaking social research can help us get to "YES" in our back yard. These trainings are encouraged for anyone who aims to build, provide, or advocate for more homes available to persons at all incomes in their neighborhoods. VHDA partners with Housing Virginia to provide quality, affordable housing.